Tee: Asda. 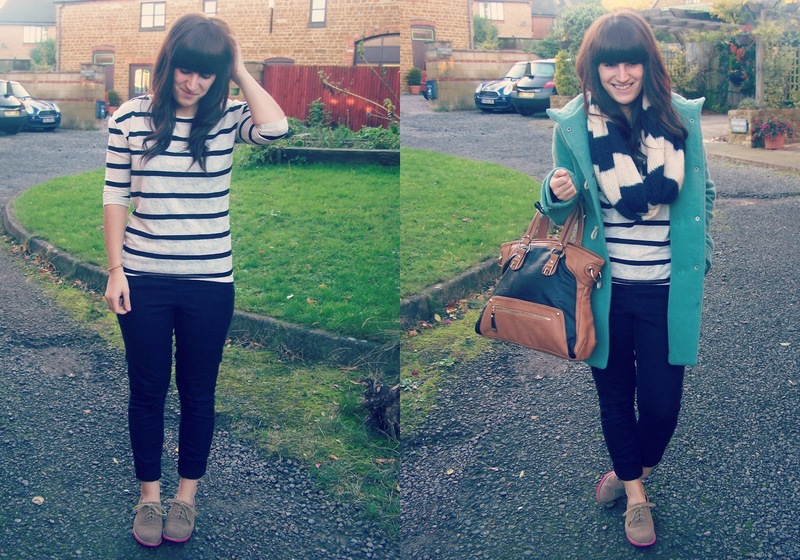 Jeans: Dorothy Perkins. Brogues: c/o Tribeca Shoes. Bag: c/o Brand Village. Coat: Topshop. Snood: Primark. So being a little unlike my normal self, and being a, dare I say it, casual lady! You see, after picking up this top from Asda whilst doing my standard overloading food shop, it's gotten me a little bit crazy for thinking I'm a tee bird...Or just a cool kid for the day. And yes, I even went a little wild and turned my trousers up, slipped on my favourite brogues and doubled up on the stripes. Mama Mcfred's been eyeing up this bag lately, so I doubt it'll end up in my house for much longer. She likes the colours as apparently in her books "it's so hard to find black and tan together these days." Guess that's me back to my one bag a year life! Today has been a sad day. I went to a close family friends unexpected funeral, and it was sad. But also wonderful and so him. He will be truly missed by a great deal of people. And for him, I'll let the nickname Maty continue. Sweet dreams Mitch. Time for the kigu, Schmidtla cuddles and a nice mug of hot ribena. Enjoy your evening! P.s Don't forget to enter my giveaway to be in with a chance of winning TWO Glamorous items!